Considering it’s the weekend before Thanksgiving I should have been a lot more productive. I did check a few things off of my to do list, but not nearly as many as I planned. First of all, I slept in yesterday morning and skipped my weekly run with my Galloway group. According to my training plan I needed to run 7 miles this weekend which was more than the group had scheduled, and I also just wanted to get some more sleep for a change! I did get up in time to go to Target just as it opened to pick up a few items before the store got crowded. (Too bad I didn’t realize that I need another pie dish ahead of time. I’ll have to go back this week.) I also hit the Ralph’s next door to cross a few more Thanksgiving ingredients off my grocery list before the holiday rush later this week. 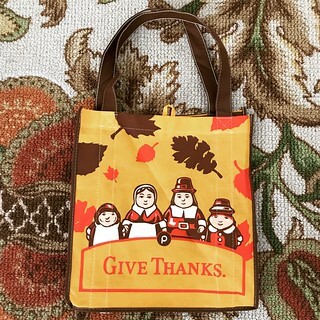 The only other thing I still need to buy is cranberries and other fresh fruits that I don’t want to purchase too soon. I’ll make one more shopping trip tomorrow or Tuesday. When I got home I got started on some boring but necessary chores – laundry and cooking. While performing these tasks I watched Friday’s episode of “Once Upon A Time” (still one of my favorite shows) and the first few episodes of “The Gifted” that I’ve been hoarding on my DVR since it premiered. Much to my annoyance, “The Gifted” seems to be pretty decent. Don’t get me wrong, I love most anything associated with the X-Men, but I certainly don’t need any more shows to watch this season. Eventually my laziness caught up with me and I had to force myself to run those 7 miles I skipped in the morning. Fortunately the Seal Beach Christmas tree lighting was taking place last night so I was able to experience it on my run. I actually went past the event at the pier three times before I was done with my exercise. 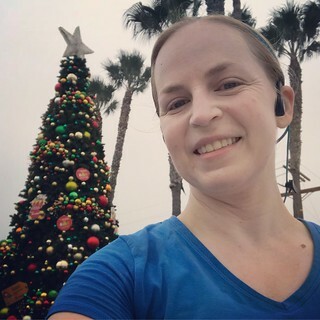 I love running in my little beach town when the Christmas tree and other festive lights are up. My Saturday night ended with me making an unexpected and major purchase. I was chatting with my friend Natalie and she reminded me that “Hamilton” will be at the Pantages Theatre in Hollywood starting soon. Back when the tickets originally went on sale I wasn’t nearly prepared enough to acquire one that way, but I figured I could browse the secondary market and get a single seat for myself for one of the shows. So I went on StubHub and spent way more money than I should have for the opportunity to attend the matinée show on December 30th. But I got a seat on the first row of the mezzanine so I’ll have an unobstructed view. I’m so excited! My Sunday was decidedly less interesting, and slightly less productive too. I had to go back to the grocery store because I realized that I didn’t have any broccoli for my lunches this week. And when I got home I had to roast said broccoli (as well as some carrots for good measure) and put my Pyrex dishes of food together for the week. Luckily I’ll only need three lunches, at most, since we have Thursday and Friday off. I might leave work early on Wednesday as well in order to make my pumpkin pies. I’d like to avoid baking on Thanksgiving Day if I can help it. Now it’s getting late on Sunday night and I still have to eat dinner, fold some laundry, and wash some dishes before I can go to bed. Holy cow, where did the weekend go? I was hoping to put up my Christmas tree before Thanksgiving (because why not? ), but I guess it’ll stay Halloween in my house for a little bit longer. Now excuse me while I finish up my weekend chores by the glow of jack-o-lanterns! Turns out I didn’t have enough free time while I was in Las Vegas to write anything at all. It was a whirlwind trip with very little down time. So when I got home this evening (around 7 PM due to heavy traffic headed back to Los Angeles) I sat down with my laptop to try and write a decent blog post. Obviously I was unsuccessful. I’m tired and dreading the week ahead, so I escaped into the world of the Academy Awards. It wasn’t too long ago that I fervently tried to see as many of the Best Picture films as possible before the Oscars, but it’s been impossible to find the time for that these days. Especially now that there can be up to ten nominees. And this year may be my poorest showing ever. I looked through all of the nominated movies and I’ve only seen five of them – none of which fall in any of the major categories. Take a look at the list below. First of all, I’m supremely embarrassed to not have seen “Hidden Figures” yet. As a woman in the aerospace industry I’m a little ashamed that I never made it to the theater for such an important piece of cinema. But in maybe an even more shocking confession, I haven’t even seen “Moana,” for heaven’s sake! This should highlight just how few times I’ve gone to the movies in the last six months. Fortunately there’s always On Demand to help me catch up on some of this year’s most acclaimed films. That’s if I can find any free time. 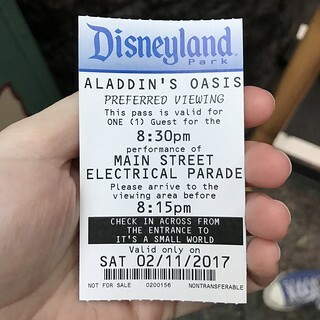 My last day off of work was February 11th, the day I went to Disneyland to see the Main Street Electrical Parade (which I wrote about last week). Starting last Sunday I worked night shifts for five days, and then put in as many hours as possible in the office over the weekend. That kind of schedule doesn’t make for much of a social life, but sometimes it is necessary. On Friday morning I blearily stumbled out of work at 6 AM. There was a major winter storm bearing down on Los Angeles that day, but it hadn’t arrived yet. I was lucky to get home before the crazy wind and rain hit Orange County. I fell asleep around 9 AM and slept through a lot of it, but I had to get up around 2 PM to get ready for an appointment with my sports chiropractor. It was still storming when I had to leave the house and an umbrella wasn’t the least bit effective in such severe weather. I threw on my raincoat, but still got soaked by the time I got to the chiropractor’s office. The reason I was there was to get some relief from my knee pain before starting my highest mileage week of LA Marathon training. My chiropractor does great work, but it always hurt like crazy during the treatment. He always leaves bruises behind! It’s worth it for the great results, though. After I got home again I knew I needed to get ready and go to work, but I stalled because of the terrible weather that I wasn’t willing to face again quite yet. I even resorted to filing my taxes to have an excuse to stay home a little longer! (The good news is that I got a decent refund.) Eventually I made it to work for a few hours to make sure everything was set for the tests I planned to run over the weekend. On Saturday I woke up late because my body still hadn’t readjusted to a normal schedule (i.e., being awake during daylight hours) after a week of night shifts. I dragged myself to work for eight hours, and only got home in time to wash a load of laundry before bedtime (workout clothes, of course). Sunday was slightly more interesting because I didn’t go to work first thing due to some computer maintenance that was happening in the morning. 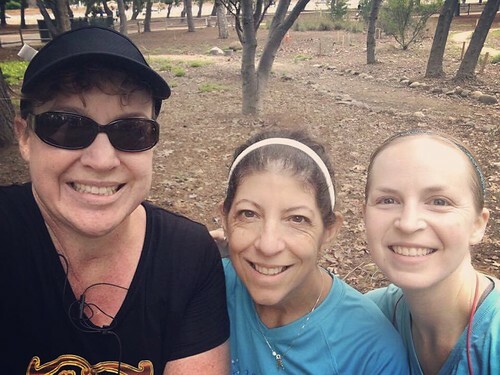 It was the perfect time to get together with my running buddies and complete a 14-mile LA Marathon training run. We ran on a path in Brea which was very pretty, but our pace was much slower than usual. We also got rained on for a while in the middle. It wasn’t the most pleasant experience, but luckily, thanks to the slower pace, I still felt good when we were done. The downside is that we weren’t done until a lot later than I expected. I drove home, ate lunch, showered, and rushed to work as fast as I could, but I didn’t get there until 2 PM. After seven hours there I managed to escape. Since it was already 9 PM all I accomplished after that was getting ready for work the next day. And thus a busy, but not very entertaining weekend came to an end. Hopefully I’ll have something more interesting to write about after this coming weekend. I survived my first night shift, but it was rough. I was completely exhausted when I got home earlier this morning. Now I’m getting ready to go to boot camp before my shift starts tonight. This week is just terrible! Saturday was a perfect day. 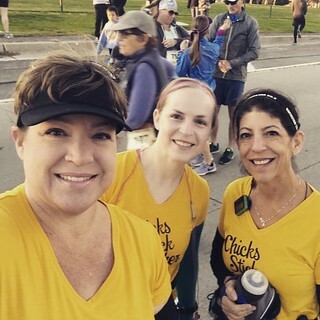 It started out a little rocky when my alarm went off at 5:30 AM so I could get ready for my 18-mile training run for the LA Marathon, but then I went back to sleep for an hour. Luckily the weather cooperated to make my run comfortable even though I didn’t get started until 7:30 AM. Running 18 miles this time around was more difficult than back in December, but I successfully completed the feat without any serious problems, and that’s what really matters. 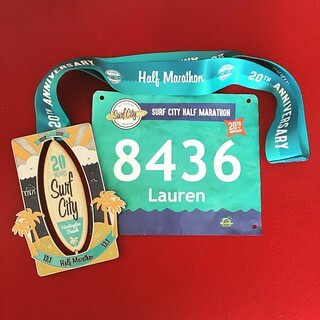 In fact, I felt better after 18 miles than I did after the Surf City half marathon the weekend before, which is extraordinary. Miraculously there was no knee pain, no foot pain, and no nausea (thanks to some nutrition tweaks), but I did realize that my running shoes are at the end of their life. They will always have a special place in my heart for helping me survive my first marathon, but out of necessity I will start breaking in a new pair (that just arrived today, actually) this week. As much as I wanted to relax when I got home there just wasn’t time because I had plans in the afternoon with Natalie. We were supposed to have a birthday celebration at Disneyland back in January, but we had to postpone because we were both sick as the day approached. Luckily two weeks later we were both almost fully recovered and ready to take Disneyland by storm. In reality, the first thing I did was wait in a really long line at the ticket booth to renew my Premier annual pass. For some reason the Florida/California pass is the only one that can’t be renewed online, which is annoying. Since I’m going to Orlando in November and January it makes sense for me to get the dual-coast pass at least one more time. It was a little complicated, but eventually I walked away with a new annual pass that doesn’t expire until March 30, 2018. Fantastic! Much to our chagrin, Natalie and I discovered that Disneyland was insanely packed that day, maybe because a ticket price hike was going into effect the next day. 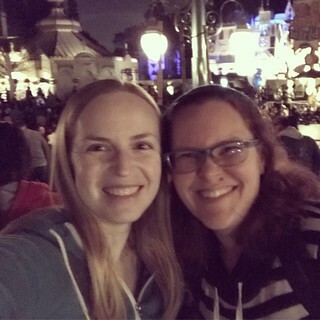 We only managed to get on a couple of rides (Haunted Mansion and It’s A Small World), but that was OK. We had dinner, shopped, hung out, and basically had a great time. The real purpose of our visit was to see the Main Street Electrical Parade which has recently returned to Disneyland after a stint at Disney World starting in 2010. Shockingly I’d never seen the Electrical Parade before so it was an amazing experience. I was entranced. We also stuck around for the Disneyland Forever fireworks which I hadn’t seen since about 2014. After all of that I deemed Saturday a perfect day. We all need lovely days like that every once in a while. Since I was trying to prepare myself for working nights this week I intended to stay at Disneyland until it closed at midnight, but I was way too tired to do that. I might have been able to power through it if the lines for the rides were shorter, but the crowds didn’t thin out very much even after the fireworks. Natalie and I left to drive home at 10:30 PM. My perfect day ended with me struggling to stay awake after I got back to Seal Beach, but I did manage to avoid going to bed until about 2 AM. Working nights this week is going to be awful, but at least I had a great weekend beforehand! As far as I’m concerned it’s Saturday night, but this post isn’t going to be finished until Sunday because it’s already after midnight. Normally there’s no way I’d still be awake this late, but I’m trying to alter my sleep schedule since I have to work nights this week. It’s going to be awful no matter how I prepare, but hopefully I can make the transition slightly less painful. My plan for tomorrow (or rather today, since it’s technically Sunday already) is to go to bed as late as possible (hence why I’m awake in the wee hours of the morning) and then sleep as late as possible so that I’ll be at least somewhat prepared to work my shift that starts at 10 PM. Unfortunately I’m really struggling to stay awake right now. It doesn’t help that I woke up early today to go running, and then met my good friend Natalie at Disneyland to see the Main Street Electrical Parade which has recently returned to Disneyland. This was my first day off from work in two weeks and I loved it. I wish I could write more about it tonight, but I’m so tired that I can barely see straight. I think it’s finally time to give up and go to sleep. More details tomorrow! Happy Easter everyone! It’s been far too long since I wrote anything, I know. It’s been a busy month! But before I write anything about this latest holiday let me catch up on some of the events from earlier this month. The good news is that I’m getting back to running regularly again. I’m still pretty out of shape, meaning my lungs feel like they’re on fire when I run at even the slowest possible pace, but at least my leg isn’t hurting anymore. As of my last post I had run one time without pain and the orthopedist gave me the green light to ease back into my normal routine. So that weekend I made a bit of a judgment call (that a friend of mine questioned, actually) and ran two 5Ks, the Country Music 5K in Anaheim on Saturday and the San Diego 5K (in San Diego, of course) on Sunday. 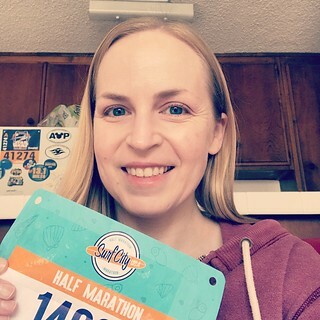 I was actually registered for the San Diego Half Marathon, but after not running for a month I knew I wasn’t ready for that distance even if my leg wasn’t bothering me. I’ll try it again next year. I felt great during the 5Ks (with the exception of the burning lungs from having lost all of my endurance), but my leg started bothering me again the next Monday. I was concerned that I did indeed have a stress fracture, which the doctor warned me was a possibility, so I made a follow-up appointment with the orthopedist for the next week. Unfortunately my cold also had a resurgence after those two 5Ks. I guess I was overly ambitious that weekend after being injured since early February and sick since the end of my vacation because I felt horrible on Monday and Tuesday. The next week was busy as well. Thursday was St. Patrick’s Day so I had to represent my Irish heritage, but I realized that I don’t have a lot of green apparel in my wardrobe these days. My green North Face jacket would have been perfect except the spring weather was too warm to make it a feasible choice. I do have a couple of great St. Patrick’s Day t-shirts, but neither would have been really work-appropriate. (Hello Kitty is perfect on the weekend, but I generally avoid cartoon characters on my clothes when I go to the office. Except maybe on Fridays.) So I donned my dark green pants and a black shirt and decided that the outfit was sufficient for a weekday St. Patrick’s Day. However, just as I was arriving at work that morning one of my co-workers asked me why I wasn’t wearing green. Really? Do green pants not qualify? It turns out the dark green threw a lot of people off that day so I had to defend my St. Patrick’s Day participation a few times, but at least I avoided being pinched. The next day I went for a 5-mile run after work and I’m happy to say that my leg felt mostly fine. I hadn’t seen the orthopedist yet, but I was pretty sure that the lack of pain meant that I didn’t have a stress fracture. This made me really happy because I was registered for the Hot Chocolate 15K in San Diego that Sunday and I really didn’t want to skip it. They have four candy stations along the course! How could I miss that? I knew running 9.3 miles would be a challenge at my current fitness level (or lack of it), but I figured I could complete the race without any ill effects as long as I didn’t push myself too hard. The course turned out to be incredibly hilly and challenging, but I survived and I’m glad I did it. It convinced me that I can ramp up my mileage in preparation for my next half marathon in April. Let’s hope I can put this injury and illness combination completely behind me soon. It’s been long enough!